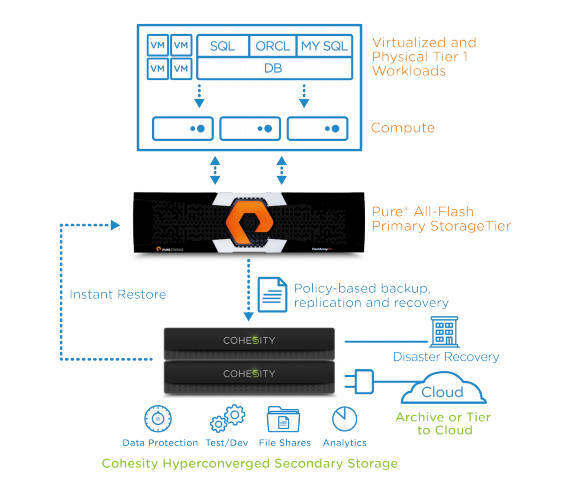 Cohesity and Pure Storage are now best buddies, collaborating to push Pure FlashArrays for primary data storage and Cohesity’s C2000 for secondary data storage. This is a neat duo deal, capitalising on the marketing needs of both, and, no doubt, setting the stage for other similar deals between primary data and secondary data one-trick pony suppliers. We could imagine Kaminario and Rubrik hooking up, maybe, or perhaps with Nutanix? Or even SimpliVity and Rubrik? Credit Acceptance and Tribune Media are two customers using a Pure-Cohesity sandwich system.